A clean fresh salad perfect of those warm summer evenings. Whisk together olive oil, vinegar and tarragon in a large bowl. Place broad beans into boiling water and cook for 3 – 4 minutes. Using a peeler, peel ribbons of zucchini and celery. Add ribbons to boiling water and blanch quickly, then drain well. Toss vegetables in dressing and allow to cool. 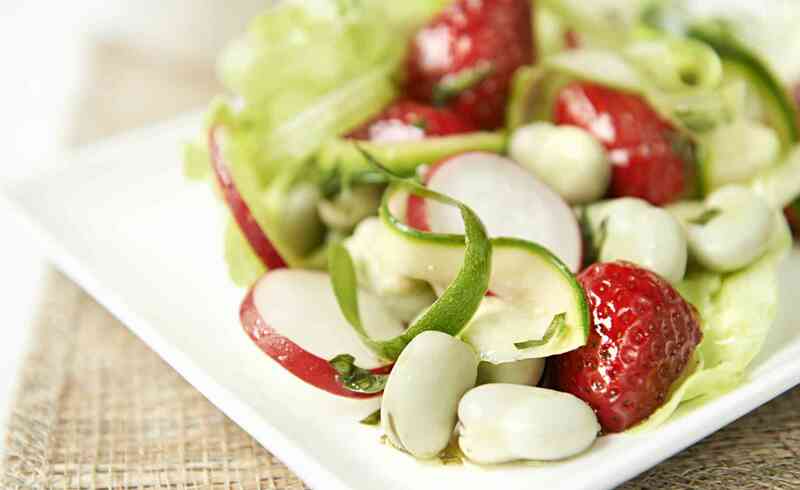 Slice radish and strawberries thickly, and toss into broad bean mix. Place a large lettuce cup or leaf on a serving plate, fill with salad mix and scatter with micro herbs.